Eagerly preparing for my first, official, Sierra Club, now SPS, Sierra peak lead since 1987, when I endured the local chapter ban, I left home a few days early. I did some hiking and other peak climbing on my way south along U.S. 395. Our full group of six met at 7:30 a.m. Friday, at the North Lake trailhead up Highway 168. The weather had been funny, the day before. 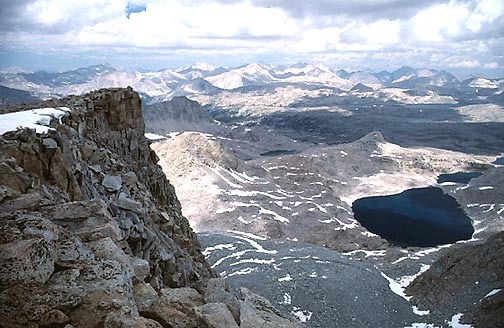 Also, the Inyo National Forest, by an article in a local paper, had tightened up its bear regulations. I had to spend time to brief the group, so we didn't make our start until 8:20 a.m. 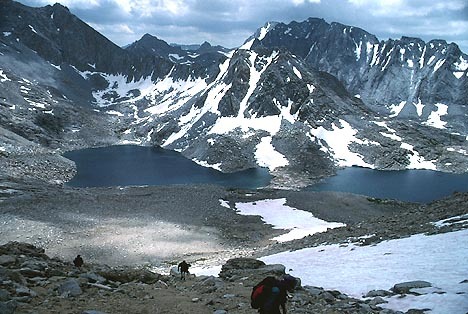 I led up the Piute Pass Trail, at a good pace at first. Clouds came in early, then we heard thunder. Light rain fell. I had to caution everyone about the lightning danger. We all chose to continue. There was plenty of snow, still, at the Pass. The rain had slackened, and then we came shortly to Summit Lake on the west side of the pass. My problem, as leader, was to find a spot well away from surface water, and that could provide some safety against hungry bears. I was the only one to have a bear canister (borrowed from a friend), so we had to find a big rock that bears couldn't climb, or cracks in rocks, into which we could stuff food, where bears couldn't reach. The nearest sizable trees were miles away. A spot along the trail proved great for all of this! One climber then signed-off and headed for Pilot Knob, already. The sun broke out, and the mood became pleasant. I had advised people to leave any extra food, and bring only just enough for the trip. It was a long walk to the lake for water, but we complied admirably with the backcountry regulations. I had taken an afternoon scouting hike to Muriel Lake. This lies enroute to our first peak, Mt. Goethe. Things looked fine. The sunset was fairly interesting. I shot several pictures. I was in the High Sierra once again. It was a great feeling! The next morning, we began at an earlier hour for the peak. Our route was to go past Goethe Lakes, where one of the climbers decided to drop out. The way back to camp was clear, so I signed her off. The rest of us climbed over large talus and snow to Alpine Col, where I gauged the weather. There were winds with big clouds, but no thunder yet. Tempted to call it, I adjudged the group's sentiments, and we headed on. A slight 400' drop to the lake, on the other side of the col, led us along on snowbanks. We hiked to a point where we could head around and up for the top. A broad scree gully led up and up. Clouds scudded overhead, but still, there was no electrical threat. We summited at 12:45 p.m., and enjoyed majestic, dramatic views. Mt. Humphreys, Darwin, and Goddard all showed themselves. The soft light with snow etching the peaks and gullies blew me away. I congratulated myself for the fine lead, and for not turning around. Spending 40 breezy minutes on top, we retraced our route back, and the weather continued to hold. The ice floes on one lake made a nice photo. Having a sight of Mt. Humphreys across the way, we came back to camp, and regaled in our success. I boiled four liters of water for the next day, which would be a long one. I had chicken noodle soup, and watched the shooting stars that night. Our third, last, day dawned clear and warmer. Hiking by 6:45 a.m., we contoured northwest at about the 11,200' elevation. Hiking past lakes and rolling terrain, we came to the base of Pilot Knob. Another party was descending from the peak, and we spoke with them briefly. One spoke of a "knife-edge," which was easy scrambling, for us. Bagging the peak, signing in the register, enjoying the views, then returning to camp, all went well. In a rush to pack out and get home, two asked to sign-off. They didn't go much faster than our group, so they then stayed with us. I liked the dusk light on the Piute Crags. The Piute Pass Trail goes quickly, and we were back to the cars by 7:16 p.m. The others sped off, with a six hour plus drive back to the L.A. Basin. I had a nice dinner in Mammoth Lakes, and arrived home in the wee hours of the morning. Two more peaks to add to my SPS total! Wondrous! The total stats for these two peaks were about 28 miles with 7,300' gain.